Today I have this human interest story from the world of sports. The reporter is Vladimir Zaivy. Currently the Russian city of Krasnoyarsk (which is way out there in Siberia) is hosting the 2019 Winter Universiade. This is an international competition, a sort of Winter Olympics for college students. In 2013 the Executive Committee of the International University Sports Federation (FISU) in Brussels, elected Krasnoyarsk as the host city for the 2019 venue. Events include Alpine and Cross-country skiing, Snowboarding, Curling, Hockey, and Figure Skating. The opening ceremony on March 2 was hosted by Russian President Vladimir Putin. The torch was lit by legendary Russian athlete Svetlana Khorkina. The slogan of the games is “Real Winter”, appropriate for a Siberian city! The official mascot is a Siberian dog of the “Laika” breed, a symbol of “loyalty, friendliness, joy and unbrided energy”. The athletes from all over the world are being housed in college dormitories and other residential complexes. The games will be closed this coming Tuesday, March 12, with all the pomp of the torch being put out, and so on. All great fun and a wholesome endeavour! Unfortunately, Zahra was not able to start taking ice-skating lessons until the age of 13, which is relatively “old” in figure-skating years. Yes, they do have ice rinks in Abu Dhabi, she trains at a place called Zayed Sports City. According to her wiki, Zahra had to overcome some initial resistance on the part of her father, who is a strict Muslim. But not to worry, she doesn’t wear the skimpy dresses nor flash her legs, you would never see her doing the “Tuktamysheva” strip-tease on the ice; no, Zahra skates her programs in full Shariah get-up, including the hijab. Despite her late start, Zahra is apparently talented, she has all the flexibility needed, wonderful “extension”, and is able to land a triple-loop jump, no easy feat! What are your impressions of the Winter Universiade? I am, of course, delighted to be performing here. I am the first athlete from the Emirates who has ever competed at these winter games. Usually my fellow-countrymen compete during the summer! Never before in winter. It’s a beautiful city. There is a nice atmosphere here, but it is very cold. Everybody I have met at the games, are very pleasant people. Yes, I will be the first athlete from the UAE at the Winter Universiade, the first figure skater from my country, and also the first to perform in a hijab! As an athlete from the UAE, have you encountered any hurdles? The biggest problem for us, is not having enough rinks. There is only one specialized ice surface in Abu Dhabi. The other ice surface is designated exclusively for hockey. And that’s all there is in the UAE. Therefore it is understandable why I would be the first athlete from the Emirates [to compete internationally]. And when you are the first one to do something, then one always encounters difficulties. Does the government provide you with assistance? Absolutely. And it also assists other young women who are trying to achieve something similar. Any woman can become her country’s ambassador in the world of sports. What is your goal at the Universiade? To skate my program as best as I am able, and to improve on my previous results. As for the future, I hope to compete at the Winter Olympics in 2022.
Who is your favorite figure skater? The Russian girl, Medvedeva. I love the way she skates, the boldness that she shows out on the ice. She loves her sport, and gives her all to it. Evgeniya says to all figure skaters, that all athletes experience difficulties and obstacles. But the main thing is to love what you’re doing. And then one can achieve good results. For whom did you root at the Winter Olympics in PyeongChang? For Evgeniya Medvedeva, or for Alina Zagitova? Zagitova is a wonderful athlete who trains many hours a day. They both deserved the gold. What kind of skating competitions do they have in the UAE? The FBMA Trophy: Fatima Bint Mubarak Ladies Trophy. Last year they hosted athletes from 28 countries. 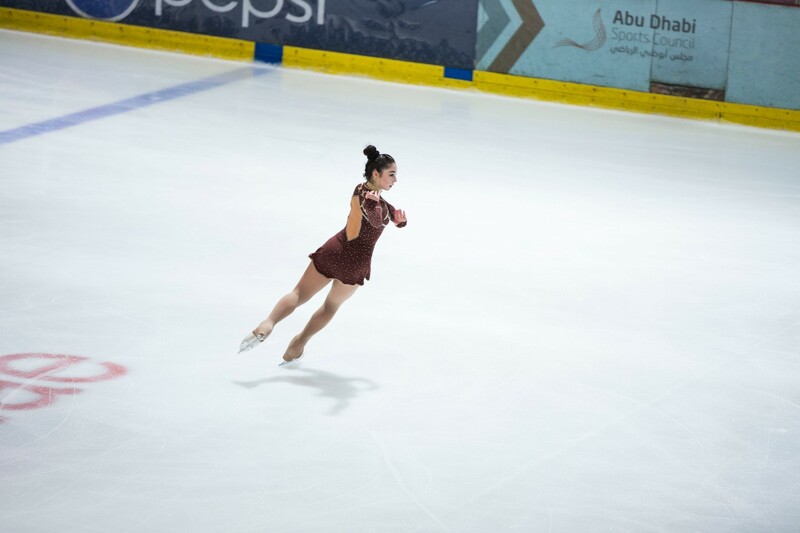 More and more people want to watch the competition, but this type of sport [figure skating] is still new to the UAE. We are hoping to invite more competitors, along with our own athletes. In addition to that, we have conducted national competitions already four times. In all of the UAE there are around 100 girls involved in figure skating. Of course, not all of them are at the world level yet, but this is just the beginning. I would like to see successive generations of girls get involved in sports, like I do. How do people in your homeland react to your figure skating? They encourage me, and they approve of it. They really want me to compete in the Winter Olympics. I get a lot of support in the social media. People recognize me in the stores and say nice things to me. I believe in myself, but without this social support (as well), it would be harder. Do you have personal fans? Yes, at every competition there are people who root for me. And not just regular people in the audience, but also my figure-skating competitors! They come up to me and encourage me to continue skating. This is why I hope to go to the Olympics and achieve higher scores. When I went to Japan for the Asian Winter Games, there were a lot of fans rooting for me. I also have supporters here in Russia, and not only in Krasnoyarsk. Do you get messages from Russian fans? Yes, they write to me, that they live nearby and support me. How are you training for the Universiade? My (local) coach Alexandra Ievleva is helping me to iron out my program. For example, on March 2 we worked on just basic exercises, nothing complicated, since we had only just arrived the evening before. Have you prepared any special tricks for the Universiade? I will attempt a triple loop jump in my program, I hope to complete it successfully and nail my landing. Recently I have been making certain mistakes, but I am hoping to correct them once I am back in Abu Dhabi, after the Universiade, so that I don’t repeat these mistakes in the future. Would you want to compete in other competitions in Russia? If there are opportunities to do so, yes. They have some very big competitions here, Russia is amazingly strong in this sport. I hope to return some day. Maybe I can even train here in the summer. That would be a huge experience for me. What is the hardest thing about your training, and what is your favorite element? As opposed to competitions, the training sessions themselves always give me satisfaction. The competitions are wrought with tension. But the warm-up sessions before the start are always interesting to me. The hardest thing for me was to get used to the weather, the snow, the local scenery. Competing is always tough for me, and not just here, at the Universiade. But on the other hand, I always feel great at every event. I am very proud of the UAE heraldry on my uniform. This entry was posted in Sports and tagged Zahra Lari. Bookmark the permalink.